ALAN STUBBS has warned his players to ignore the troubles Dundee United have suffered in recent weeks, insisting his team will have to be every bit as good as they were against Rangers at the weekend to win tonight’s League Cup quarter-final clash. The visit of the Tannadice outfit is a repeat of last season’s encounter between the sides in the competition, United then the in-form team in the Premiership, winning a sudden death penalty shoot-out after Hibs had come from behind three times to force a 3-3 draw. Today, though, United sit bottom of the Premiership table after a miserable run of results saw boss Jackie McNamara sacked and replaced by ex-Hibs player and manager Mixu Paatelainen, the big Finn enjoying his first win at the weekend while Stubbs’ players clocked up an 11th game undefeated as they trimmed Rangers’ lead at the top of Championship to five points. 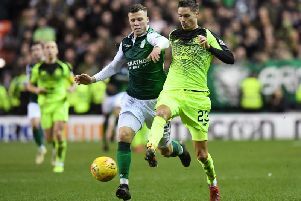 However, while he believes Hibs are a much stronger team than a year ago, Stubbs insisted that doesn’t guarantee his side will triumph this time round. Recalling last season’s match as “probably similar” to Sunday’s clash with Rangers in that it was an entertaining affair with lots of chances and goals at both ends, the Hibs head coach said: “We’ve moved on. W’re a strong team since that night but it doesn’t mean the result is going to be any different. “It just means we are more capable of getting better results and, unless we perform really well, we won’t progress in the cup, It’s irrelevant where Dundee United are at this moment in time or what has happened over the last few months. Meanwhile, Stubbs insisted he wasn’t in the slightest surprised to discover representatives from various clubs have been flocking to Easter Road to cast an eye over striker Jason Cummings, with Rotherham chief scout Gee Evans present to see him take his tally to 11 for the season and 35 in just 51 starts for Hibs with his stunning opener against Rangers. Fulham are the latest club to be credited with an interest but Stubbs stressed all he wants to see is Cummings continue to score goals, revealing plenty of hard work is taking place to make him an even more potent threat. Accepting comparisons will be made with Leigh Griffiths, Stubbs believes the players are different – the one likeness being they both score a variety of goals. However, he said: “I’d say Leigh scores more headers as you saw with his finish at the weekend. That’s one thing we will work on with Jason.